Contrinex is a leading man­ufacturer of inductive and photoelectric sensors as well as safety and RFID systems. 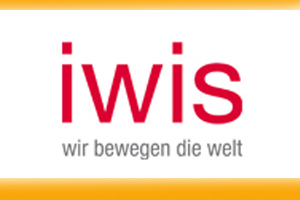 The Swiss in­novation company has a broad product range and is now represented in over 60 countries worldwide. 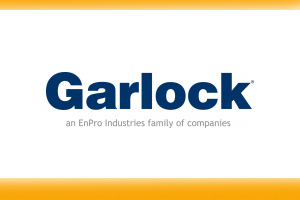 In the field of miniature sensors, full-metal components, sensors with long switching distances and solutions for demanding environmental condi­tions, the company is a world market leader. Contrinex is a trendset­ter in innovation and is constantly setting new standards in the field of sensors. An example of this is the standard equipment of sensors and new RFID read/ write modules with an IO-Link interface. This interface is an impor­tant prerequisite for the networking of processes (Industry 4.0), since it enables sensors to be in­tegrated into the entire communication system via IO-Link. Reading and analyzing relevant process data is not the only advantage. It is also possible to set sensor response behavior and influence the output on-or off-delay. Users also have the op­tion of remotely con­figuring the sensor via IO-Link, saving lengthy changeover time, espe­cially in hard-to-reach installations. Devices can be used either as binary sensors or as sensors with a data interface. So the customer does not have to decide be­fore buying, how any sensor will ultimately be used. A major innovation is the photoelectric sensor TRU-C23, which Con­trinex launched on the market in 2017. 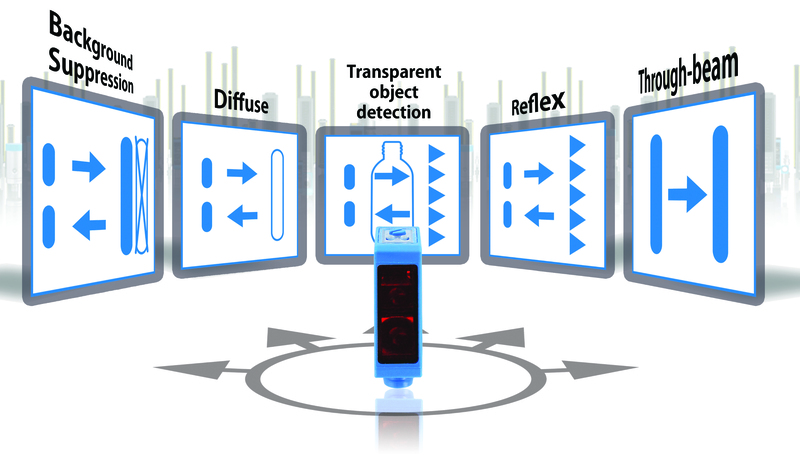 This sensor is ideal for controlling the presence of transparent objects – a task that pushes con­ventional optical sensors to their limits. 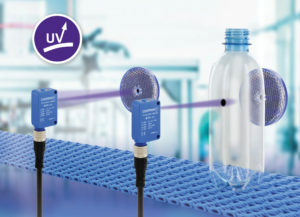 The TRU-C23 uses polarized UV light and a reflex operating principle. Since even transparent materials such as plastic or glass readily absorb UV light, the threshold at which the sensor switches can be set very easily. This makes commissioning much easier. The hous­ing, measuring just 30 x 20 x 10 mm, is com­patible with the entire C23 series as well as comparable devices. 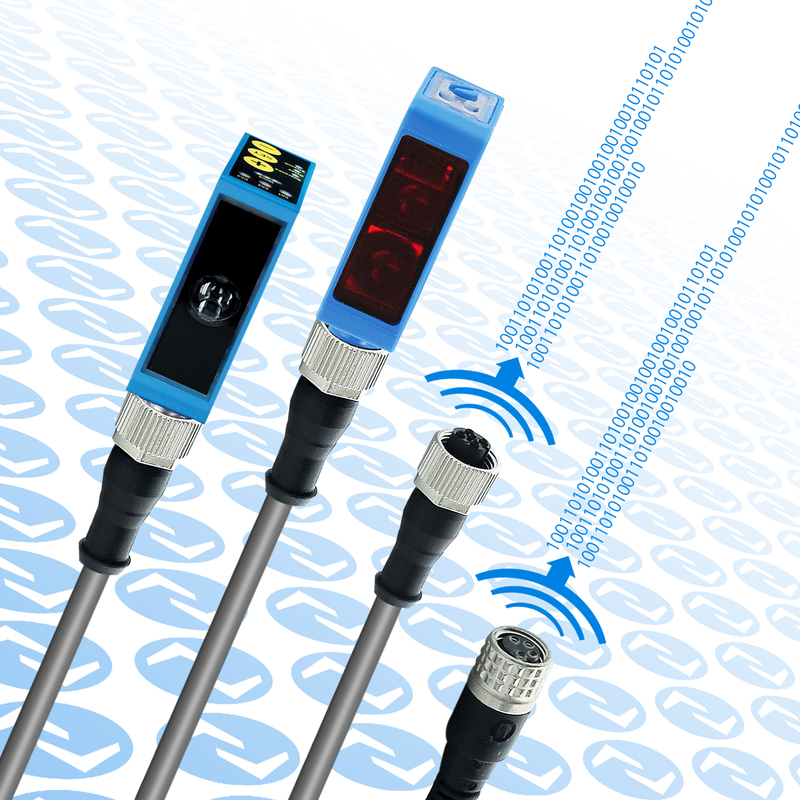 Like all C23 sensors (diffuse, reflex, back­ground suppression and through-beam types) the TRU-C23 includes an IO-Link interface at no extra cost, is Ecolab tested and approved, rated to IP67 and reli­ably withstands com­mon industrial cleaning processes. Typical applications for the TRU-C23 are pack­aging systems and fill­ing systems for glass or plastic bottles. With their robust stain­less-steel housing and IP68/IP69K protection rating, the full-metal sensors of the Full Inox family are virtu­ally indestructible. They withstand corrosion and salt water as well as pressures up to 80 bar. Operating distances are particularly long, with factor 1 on steel and aluminum. Thanks to the integrated ASIC, Contrinex can manufac­ture Full Inox sensors with diameters as small as 4 mm – making them the smallest inductive sensors with IO-Link in the world. For applications in which sensors are ex­posed to aggressive chemicals, dirt particles or high temperatures, Full Inox Washdown sensors are ideal. These sensors in food-grade stainless steel V4A are Ecolab-certified for continuous use under harsh conditions with stringent hygiene stan­dards. 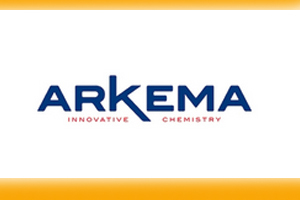 This makes them ideal for position and presence monitoring in the production of food, beverages and pharma­ceuticals. Metal drilling or grind­ing processes present a difficult challenge for inductive sensors. The presence of metal debris can cause false switching, especially when the sensing face is covered with a mixture of lubricant and metal chips. To avoid the need for frequent cleaning, Contrinex now offers a chip-immune series of Full Inox inductive sensors in M12, M18 or M30 housings. Even when covered with chips of iron, aluminum, stainless steel, brass, copper or titanium, they will reliably detect tar­gets made of these met­als. In practice, the use of these new inductive sensors can save time, money and even help protect the environment through the elimination of washing cycles. Inductive sensors for welding-cell use must meet special electrical requirements. Contrinex Full Inox Weld-Immune sensors, with resistance to medi­um frequency (up to 15 kA) and 50 Hz magnetic fields (up to 40 mT), more than fit the bill. In addition, they withstand direct contact with weld spatter and are easily cleaned, ensuring mini­mal down-time. Contrinex’s high- and low-frequency RFID systems both feature tags for high tempera­ture use. For harsh high-temperature environ­ments up to 180°C, the low-frequency system includes embeddable, salt-water-resistant, full-metal transponders in food-grade stainless steel V4A. For applica­tions with even higher process temperatures, as found in the steel indus­try or paint shops, Con­trinex offers HF-RFID tags that can withstand temperatures up to 250°C. These tags cope easily even with tem­perature cycles of more than 1000 fluctuations between 25 and 250°C. The high-performance safety portfolio com­prises Type 4 and Type 2 light curtains in both slim and standard hous­ing types. In addition, magnetic and RFID-coded safety sensors are also avail­able for precise position sensing of protective hoods, doors and flaps. These sensors (type 4 according to ISO 14119) are immune to mutual interference and highly resistant to unauthor­ized manipulation on site. 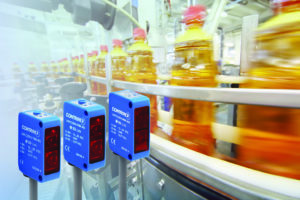 In the RFID-coded version, up to 30 sen­sors can be connected in series with just one relay or controller.